Made in Italy with the highest quality of 18/10 stainless steel, 4 mm thick, very durable, ergonomic. Dishwasher safe. 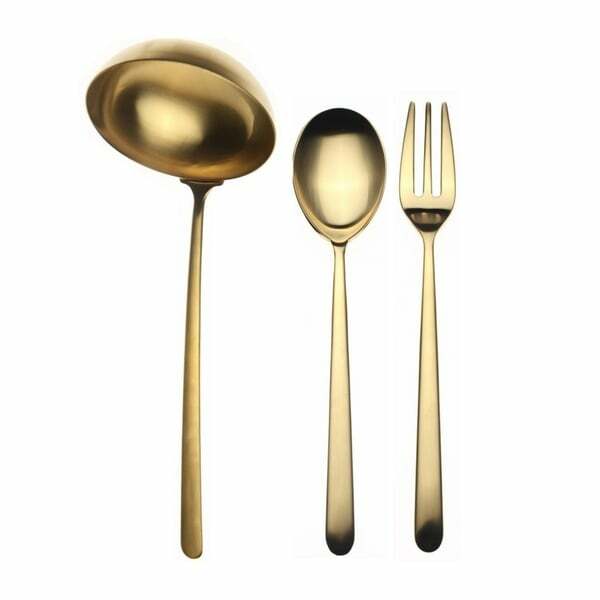 Enhance your dining experience with this beautiful Italian flatware! Stainless Steel is coated with PVD Titanium Coating. Tested and guaranteed for more than 1000 washes in commercial dishwasher. The special Titanium Plating Process, Originally developed by NASA, gives to the surface of Stainless Steel an extra-hardness and makes it dishwasher safe. The finish is durable, inoxidable, dishwasher safe and food safe. The production process is not galvanic and does not produce pollution. PVD Titanium Coating: Physical vapor disposition to apply the different finishes. Made from highest quality Stainless Steel. Flatware Lengths: Ladle (1) - 11.75 inches long, Fork (1) - 9.66 inches long, Spoon (1) - 9.66 inches long.